This Vegan Superfood Detox Salad is a great way to reset your body and get back on track with healthier eating habits. 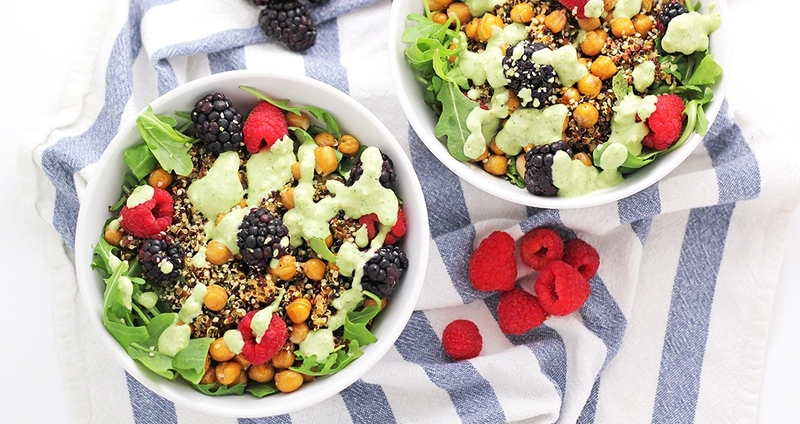 Loaded with complete plant-based protein and healthy omega-3 fats, and topped with a zesty cashew-cilantro dressing, this recipe is perfect for an easy lunch or quick weeknight dinner. Add the quinoa and vegetable broth or water to a small pot. Bring to a boil, then lower heat to a simmer and cook until the quinoa is tender and liquid is absorbed, about 20–25 minutes. While the quinoa is cooking, lay garbanzo beans flat on a sheet pan and sprinkle lightly with a pinch of salt and pepper. Roast the garbanzo beans for 15–20 minutes, until lightly browned and just crisp. While garbanzo beans are roasting, make the dressing by pouring the cashews, water, cilantro, apple cider vinegar, maple syrup and sea salt into a blender and blending until smooth. Set aside. Once quinoa and garbanzo beans are done, divide the arugula between 4 dishes and top with the quinoa, garbanzo beans and berries. Drizzle the dressing over the top and sprinkle with hemp seeds.